Jake Bucher, associate dean of the School of Professional and Graduate Studies. After beginning his journey at Baker University as a student, Jacob Bucher is now the new associate dean of the School of Professional and Graduate Studies. As an alumnus and Wildcat-at-heart, Bucher believes his experience makes him the best fit for the SPGS position. With first-hand knowledge of the university’s goals and focus on both the learner’s and the teacher’s perspectives, the sociology professor believes his insight is more valuable than any outside applicant’s. Bucher said being a part of the Baker tradition in one form or another for more than a decade has done more than make him a proud supporter of the university and its goals. He hopes that his determination to rise to new challenges, like the responsibilities that come with being associate dean of SPGS, will help him achieve his goals. Regardless of his ambitions, Bucher admits that he would not have necessarily accepted the job if it had been anywhere other than another BU campus. The titles associate professor of sociology and chair of department of criminal justice, along with a Kopke Award for Distinguished Teaching and other various campus honors, stem from Bucher’s time spent teaching Baker students from both the traditional and SPGS campuses. Senior London Wise met Bucher during her sophomore year and describes every one of the classes she has taken with him as “absolutely incredible.” Her favorite is his prison course unique to the university, in which students from the SPGS and Baldwin City campus have the class together. Having taken it last year, and then deciding to take it again this year, Wise believes its truly a one-of-a-kind opportunity not to be missed. 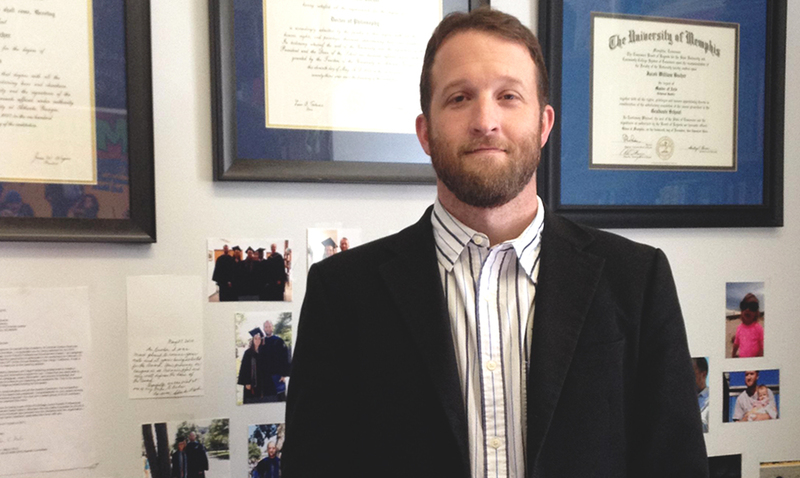 Wise thinks Bucher’s teaching style set him apart from other professors. While tests and papers are a traditional way of gauging student learning, Bucher employs smaller assignments like journals and out-of-classroom experiences. Wise would argue that though they may seem tedious, the experiences and assignments are highly beneficial to students. Wise admits that for some students, walking into one of Bucher’s classrooms can be a bit intimidating. Sophomore Katie Hibbler has known Bucher since entering Baker her freshman year. Now a sociology major because of Bucher’s influence, Hibbler believes that Bucher is more than just an amazing teacher and advisor. Taking the next step in his career is an exciting and challenging adjustment for Bucher, but he is optimistic and looking forward to the experience. Although the excitement of his new responsibilities and obstacles to overcome propel him forward, the hardest part of the change for Bucher will be breaking the bonds he built with Baldwin City students. As he begins to make the position transition, students like Wise and Hibbler are sad to see him go, but understand the decision. Hibbler and Wise will miss having Bucher around to talk to everyday.